Micromosaic in Smalti Filati is a prestigious, antique technique that developed in Rome between the XVI and XVII centuries. Since 1727 it was used by Mosaic Masters from REVERENDA FABBRICA DI SAN PIETRO in Vatican City :Enzo was trained in this Vatican studio.The technique was probably invented by the mosaic master Giacomo Raffaelli, one of the most important mosaic artist living between 1700 and 1800.Originated in 16th century, it was a Vatican attempt to become independent from Venice, which had been the centre of glass mosaic material manufacturing. 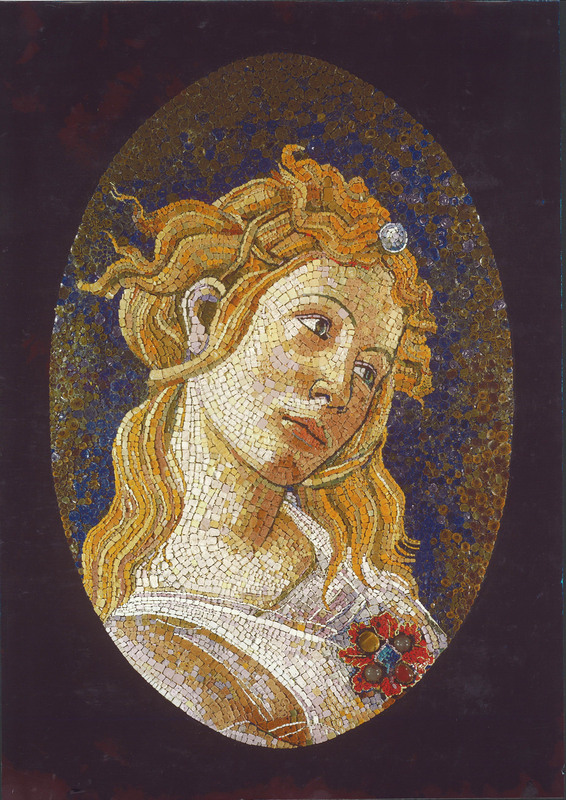 The Vatican’s own glass factory carried out a research program which led to the production of no less than 28.000 glass mosaic colors.It was however ,in Smalti (glass mosaic) manufacturing technique that the Vatican artisans attained their greatest achievements and fostered further developments. This was made it possible because around 1700 a Roman glass kiln owner and chemist, Alessio Mattioli experimented on glass Madritinte (master tints) pancakes, namely colored glass paste, containing a high percentage of coloring agents,he discovered how to make opaque glass in hundreds of different colors, this new development was encouraged, supported and protected by the Reverenda Fabbrica di San Pietro ,in Vatican. At present, the Vatican Studio ,who first took advantage from Mattioli discoveries, has about 28.000 colors in stock.Matteoli’s discoveries are so jealously guarded by the Vatican that even today very few people are party to the secrets.It goes without saying that Matteoli’s discoveries are exceptional; it’s enough to realize that this same opaque glass created by him, when exposed to heat, transforms itself into a malleable substance and is easily drawn out into a thread. This allowed the creation of long thin rods less than a millimeter in dimension.With this filament glass enamel technique ,the tesseare are not made with the mosaic hammer and the hardie but from the rods obtained from a spinning procedure.The technique of filament mosaic makes use of vitreous enamels that, under a flame 900 C° ,can be mixed and molded to create rods of different colors and forms.This technique makes mosaic resemble painting as the enamels are mixed as if they were oil or tempera colors until the desired shade is obtained.The enamels are placed on a hardie towards which a powerful flame generated by gas and air is directed.At about 900 C° the enamels become viscous and sticky and can be detached from the hardie with the help of a metal rod,with another metal rod the incandescent enamel is mixed ,Then it is pulled with tweezers to obtain a thin rod.The rods are incised with a sharp file and chipped with tweezers.The “smalti filati” technique makes it possible for Enzo Aiello to execute copies of painted originals on an even smaller scale and eventually even to produce actual “miniature mosaics” with “tesserae”, less than 1 mm thick, which gained widespread popularity in the first half of 18th century.Of course the views of Rome, including the Colosseum, St. Peter’s Basilica, the Pantheon and Forum ruins, are the main subjects for micro mosaics. Manufactured by Enzo for bourgeois clientele, such as foreign travelers, religious and lay aristocrats, diplomatists on official visits, these minute mosaics are employed to embellish small, everyday objects (paperweights, snuffboxes, vases, top of tables, small framed objects, jewels). Enzo micromosaics are often regarded as items of jewelry on account of their artistic refinement and technical virtuosity.